- To make swatch, cast on 20 sts and work first 20 sts of chart beg with row 9. The width should measure 5-1/2” / 14cm unsteamed. 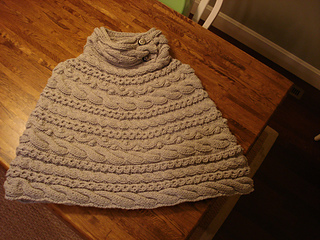 Redefine the Aran attitude in a short-row shaped poncho featuring chunky cables and crochet fringe.